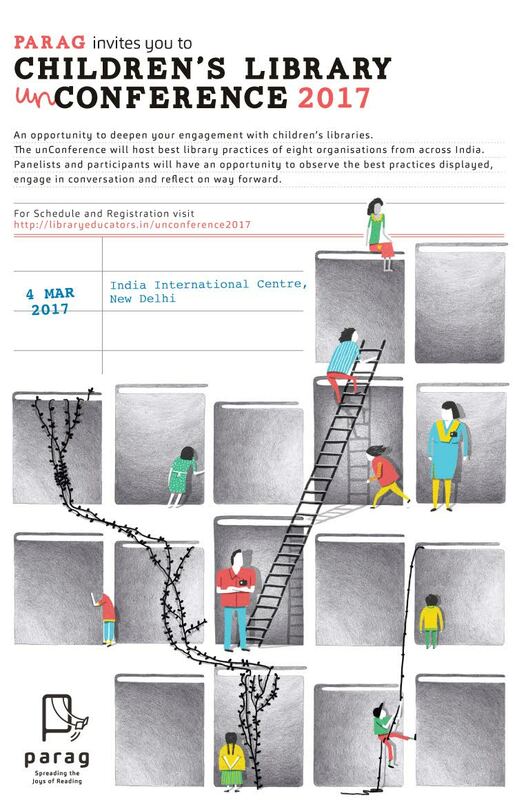 The Children’s Library Unconference 2017 in happening on 4th March, 2017. Parag’s annual Children’s Library (un)Conference aims to create a space for children’s library discourse in India. The (un)conference will act as an avenue where library educators and others engaged in the library space, with reading and children, get to meet, exchange ideas, present best practices and challenges and learn from each other. For the inaugural (un)Conference, Parag will bring together thought leaders in the library and children’s literature space. Moving away from the regular panel discussion and presentation format, (un)Conference will host displays by eight organisations doing significant work with children’s libraries (one best practice around use of library/children’s books and its impact). Panelists and participants will do a walk-through of the displays. Post lunch panelists will share observations followed by reflection and discussion that takes the dialogue forward. The discussion will actively involve participants in the audience to share thoughts and observations. We hope this format will lead to a collaborative discussion that includes all members who are attending and enable us to build a shared vision for children’s libraries in India.